Gorgeous Free Standing Home in Rancho Las Palmas! This is one of the rare free standing homes (not a condo) in Rancho Las Palmas Country Club. This is the largest floor plan and it has been expanded to include a den/family room and master walk-in closet. This 2,600 square foot vacation home was completely remodeled, updated and furnished, summer 2014. Everything is new and has been furnished with the vacationing guests in mind. Nothing has been overlooked. Mounted flat screen TVs can be found in the living room, den/family room and master bedroom suite. Beautifully furnished with comfortable contemporary décor throughout. Lots of seating in both living areas and a large dining area are perfect for entertaining family and friends. The fully custom, updated kitchen offers plenty of cooking space and is well equipped for the cook in your family. Furnished with granite countertops, stainless appliances and a long kitchen bar with stool seating. There is even a convenient power room for your guests! The spacious master suite has been furnished with a king size bed and flat screen TV and opens to a luxurious master bath with double sinks, an amazing free standing soaking tub and large walk-in shower. There is also a large walk-in closet perfect for guests with extended stays. One guest suite has been furnished with a king size bed and has a private on-suite. The second guest bedroom has been furnished with two trundle beds which make up to four twin size beds, a built-in desk/office area and a private on-suite bath with walk-in shower. 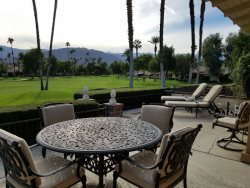 There is a private entry courtyard with seating area and an oversized, extended East facing back patio overlooking the fairway and catching lots of morning sun. Two dining areas are provide on the back patio and a convenient built-in BBQ make this a perfect spot for outdoor living and cooking. This wonderful vacation home is a very unique find in Rancho Las Palmas. It is perfect for families and guests who like to entertain. You will absolutely fall in love with this home! Also provided is cable TV, Wi-Fi. and local, US and Canada calling is free. Gorgeous views, great location, quiet street.